I've always loved vigilance in association with tap abilities. 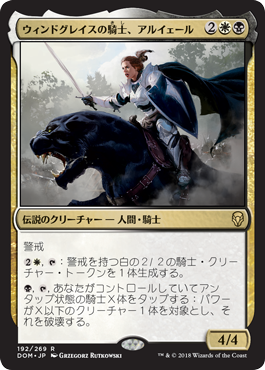 Also, she's riding a panther. That's rad. At long last, the commander who shall bring Black Knight and White Knight together. And I can even entomb Haakon. Three of each. You forgot Knight of Glory/Knight of Infamy. EDIT: Maybe more if you count Order of the White Shield and Knight of Stromgald...there's also White Shield Crusader, Stromgald Crusader, and Silver Knight. Depending on how you wasn't to stretch the definition, there's also the black and white samurai as well. That's too much of a stretch. To work in the deck they have to be Knights. Equipment subtheme maybe? Most knights are kind of on the small side. Order of Leitbur and Order of the Ebon Hand were errated into cleric knights. Lot's of Knight tribal love in this set. This card is freaking sweet. Too bad it lacks the kitty subtype, but that's to be expected. Also that armor is SO GORGEOUS. I want to see it in foil. Protection from blue isn't really useful so I think the deck would basically have a bunch of hard-to-spot-remove creatures. Too bad is has that weird deformation on the breastplate. It probably weakens the structure of armor, and makes blades slide to the neck and bolts ricochet into the chin. Scapulars seem restrictive for movement/vison and almost dangerous (may cut the cheeks or even neck if hands are in the wrong position). And of course, helmet would be a nice addition ! As much as I hate the 7e paladins I may have to use them for this.